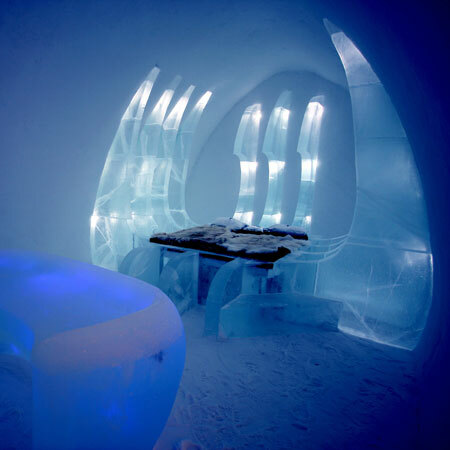 Interior designer Ben Rousseau has created a suite for the Ice Hotel, which has just opened in Sweden. Now in its eighteenth year, the Ice Hotel is situated in Jukkasjärvi, 200 kilometres north of the Arctic Circle. It is built afresh each year from ice. There are ten suites in the hotel, all designed by different artists. Rousseau's suite is called Operation Blade and features a barrel-vaulted space with a bed surrounded by fins of ice.